A DVD of the 2011 Sunset Coastal Walk is now available to buy for £6.50 each. Grateful thanks go to Peter Laine of The Digital Works for giving up his time to film and create this DVD for us free of charge. Contact Peter on tel: 736606 or email thedigitalworks@cwgsy.net to purchase a copy. £4.00 from the sale of each DVD goes to the Pink Ladies. Please click here for more information. Following the success of our third Sunset Walk, we have now received £85,000 and are delighted that we will be putting this towards the new Breast Unit. If anybody still has sponsorship to send in, we would appreciate it as soon as possible. We hope to hold our next walk in 2013. Thank you. Please click here for more information. - 22/06/2011 Please click here for more information. - 20/06/2011 Please click here for more information. Click here to download and print the Sponsorship Form. Sponsorship money can be paid in at any NatWest branch stating it is for the Sunset Walk account. Alternatively send your cheque payable to Pink Ladies to P.O.Box 92, St.Peter Port, Guernsey GY1 4BU. Please click here for more information. The following are comments on the walk from members of the Pink Ladies. Please click here for more information. We would love to receive your comments on the walk and the party. 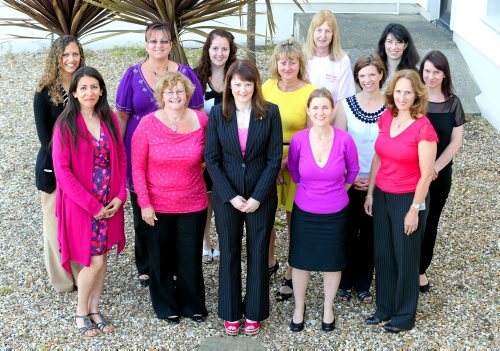 If you would like to share your thoughts on our website please email to Jo at PinkLadies@cwgsy.net Thank you. Please click here for more information. 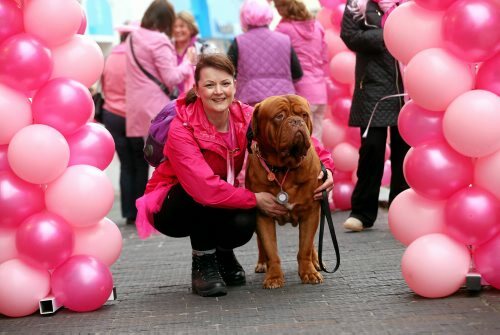 If you took any photos during the walk and would be happy for them to be included on our website please email the photos to PinkLadies@cwgsy.net Thank you. Jo Allen Please click here for more information. What was your reason for taking part in the walk. If you would like to share the reason why you took part in the Sunset Coastal Walk 2011, please email details to Jo at PinkLadies@cwgsy.net together with your photo if you want. We would love to know your personal reasons for participating and to share these with other supporters. Thank you. Please click here for more information. My mother died last year and to be honest I have been lost without her but when I stopped to think we were actually incredibly lucky. Please click here for more information. Why Paula Mechem Blake took part. Paula Mechem Blake participated in the 10.5 mile walk and raised over £1,300 from staff, management and customers at Forest Stores where she works. She said ... Please click here for more information. 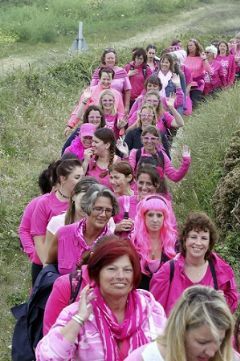 LES Bourgs Hospice has received 45,000 from the Pink Ladies, half of the money raised by the Sunset Coastal Walk. It will go towards its new development and purpose-built day hospice. 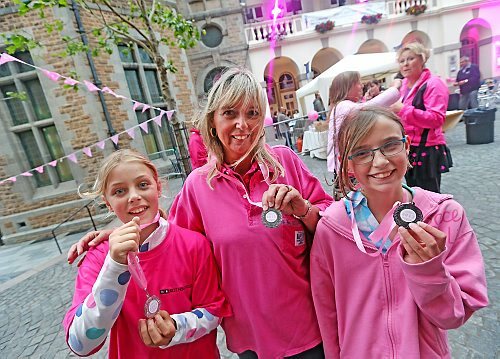 More than 2,000 women took part in this years event, which was supported by the Guernsey Press and raised 90,000 in total. Please click here for more information. ISLANDERS who stepped out for charity have raised almost £80,000. 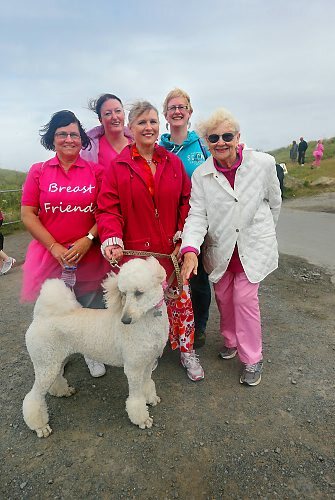 Organisers of the Pink Ladies Sunset Coastal Walk are thrilled with what they have raised so far and are keen to gather all outstanding sponsorship Please click here for more information. 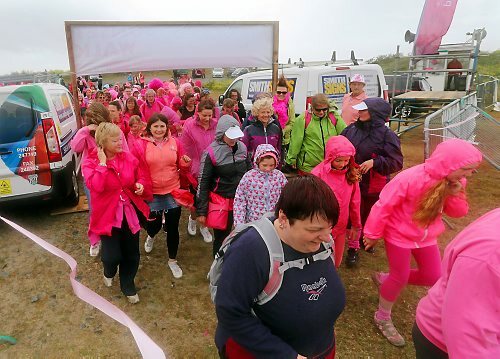 ALMOST £60,000 has so far been raised by islanders who took part in the Pink Ladies’ Sunset Coastal Walk. More than 2,000 people took to Guernsey’s northern coastal pathways on Saturday 20 June. All money raised will stay in Guernsey and be divided between the Pink Ladies, a local breast cancer support group, and Les Bourgs Hospice. Organisers are reminding walkers to get their sponsorship money in as quickly as possible so they can present half to Les Bourgs. Please click here for more information. If you would like to share with others the reason you took part ... Please click here for more information. The Pink Ladies would like to say a huge thank you to everyone who participated in the walks last night. Please click here for more information. Rebecca Young (in giant pink afro) with her mum Nicky David. Karen Kreckeler, left, and Kathy le Cras ready to hand out medals at the finish line. 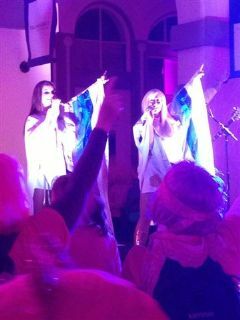 Above, left to right: Phoebe Le Cheminant, Katy Rowe and Georgia Van der Schagt. Lynda Walker at the start of the course with her dog, Henrietta. ORGANISERS of the weekends Pink Ladies Sunset Coastal Walk that more than 90,000 pounds will be raised for the new Bulstrode House breast unit. Co-organiser Doreen Le Poidevin said 50,000 pounds had been raised so far and she expected the total to rise significantly. Please click here for more information. 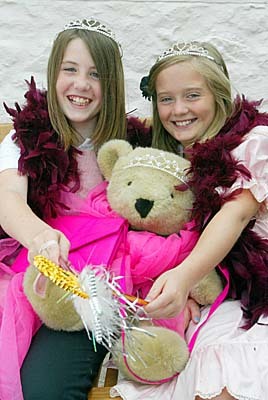 Miss Guernsey Lisa Knott with Amelia Lees, 9, who won a prize for the best dressed princess child under 12 at the Pink Ladies Sunset Coastal Walk on Saturday. Please click here for more information. Brandi Dawson leads the Zumba warm-up. 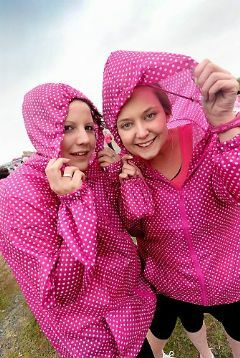 Sarah Packham (left) and Laura Kreckeler in matching spotty macs. 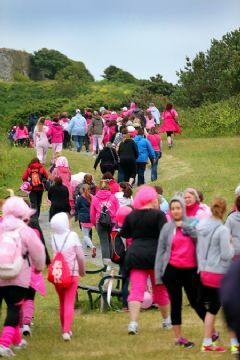 Saturday saw women and children brave the wind and take part in the Pink Ladies Sunset Coastal Walk. The group celebrated its tenth year, reports Alexa Rowe. Pictures by Peter Frankland Please click here for more information. THE Hash House Harriets completed the walk in memory of their fellow running club member June who died two years ago. Please click here for more information. Windswept participants at the start of the 2013 Sunset Coastal Walk. WOMEN-ONLY gym Curves will be helping entrants to warm up for the Pink Ladies Sunset Coastal Walk. 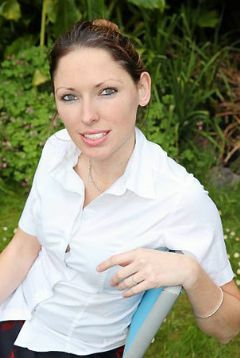 Curves Channel Islands director Cat Boyle, 28, has also issued some advice to help women get ready for Saturdays event. Please click here for more information. 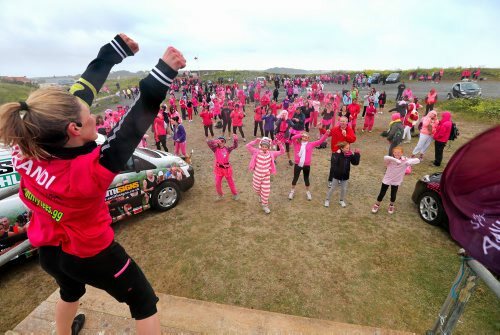 Paul Ainsworth joined the nearly 2,000 women who turned out despite the drizzle and gusting winds for the Pink Ladies’ Sunset Coastal Walk. 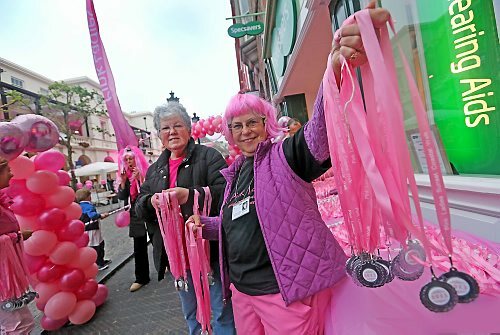 AN ALMOST endless stream of pink and smiles were on display when women of all ages pounded Guernsey’s coast in aid of the Pink Ladies. Walkers of all ages donned bright clothes, hats and fancy dress for Saturday’s biennial Sunset Walk to raise money for breast cancer sufferers. Please click here for more information. TWO beauty therapists will have their hands full after the Pink Ladies Sunset Coastal Walk. Rachel Leech and Michelle Mauger will be offering all walkers a free five to ten minute foot massage to ease the aches of walking the 10.5 or 3.5-mile route. Please click here for more information. We were honoured that Roger Allsopp agreed to start this year's Sunset Walk. A lot of ladies missed his speech as they started early because of the awful weather, so here's what he said........ Please click here for more information. The owners of Village East, Nobby & Rosita Alves decided that they wanted to do something to support the Pink Ladies Sunset Coastal Walk, particularly as this year Rosita is very disappointed to be unable to participate in the walk. They will therefore be encouraging their customers who dine there on Saturday to give a donation to the Pink Ladies - so look out for the Pink Ladies bucket. Thank you to everyone who donates - we really appreciate your support. Please click here for more information. The Pink Ladies are overwhelmed with the support they received for their 2nd Sunset Coastal Walk. Nearly 2,000 women took part to help make it such a success. The current total is 50,000 with sponsorship money still coming in! If you haven't already sent in your sponsorship money please do so as soon as possible. Please send your form and cheque made payable to "Pink Ladies" to the address on the sponsorship form which you can download here ... Please click here for more information. 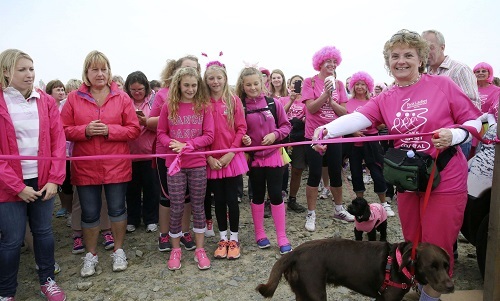 THE Pink Ladies Sunset Coastal Walk is on Saturday and money raised by the event will help pay for the relocation and expansion of the breast unit at the Princess Elizabeth Hospital. Please click here for more information. Grabbing plenty of attention at the second start point was Splash the pony, who trotted out in pink to make a special appearance. 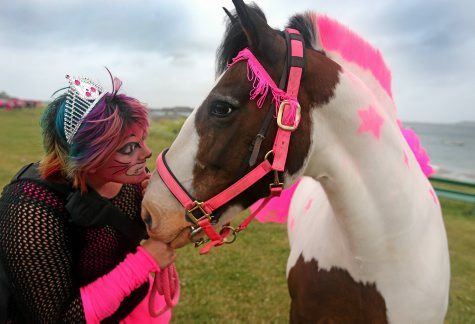 Her owner, Summer Broe, 24, got permission to take along her pet pony and stood out from the crowd in her own outfit, complete with multi-coloured hair and her face painted like the Cheshire Cat character from Alice in Wonderland. Please click here for more information. CHECKING for changes in your body on a daily basis is key to detecting breast cancer early, according to the health promotion officer for cancer prevention. Please click here for more information. 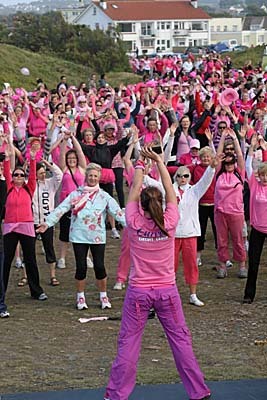 A SEA of women in pink took to the coastline to trek in memory and support of breast cancer victims. 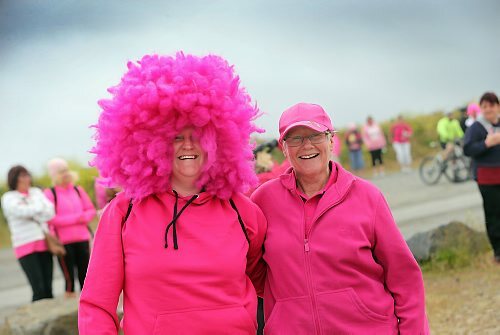 Nearly 2,000 walkers put on their brightest pink clothes, hats and even wigs to raise money for the Pink Ladies, despite damp and windy conditions for the Sunset Coastal Walk. Please click here for more information. A MOTHER diagnosed with breast cancer six years ago is urging islanders to support the Sunset Coastal Walk. Dawn Wheeler was 44 and in Mauritius celebrating her silver wedding anniversary when she found a lump in her breast. Please click here for more information. There was breast cancer in her family but Jude Harris was told not to worry – until a year ago, when a grim diagnosis proved otherwise. As hundreds of women prepare to join Saturdays Pink Ladies Sunset Coastal Walk, Jess Stevenson hears how the 46-year-old has fought her way back to health Please click here for more information. BREAST UNIT staff have been wishing all women taking part in tomorrow’s Pink Ladies’ Sunset Coastal Walk the best of luck. More than 1,500 women have signed up to take part in this year’s trek along the west coast, with all the money raised going towards the Pink Ladies breast cancer awareness and support charity. Please click here for more information. TEN women from law firm AO Hall will take part in the Pink Ladies Sunset Coastal Walk and are encouraging more women to help raise money for the local breast cancer support charity. Please click here for more information. We are still taking entries for the Sunset Walk on Saturday 22nd June so join in the fun, wear something pink and let's raise lots of money to help local breast cancer patients ! Route A (approx 10.5 miles) will start from Grandes Rocques at 6pm and Route B (approx 3.5 miles) will start from the Bordeaux car park at 8pm. Both routes will take everyone into Market Square where an Abba tribute band will be entertaining you all from approx 9pm. Partners, husbands and anyone else will be more than welcome to join the ladies there !! If you are thinking of registering now but are worried you may have missed the post, then please download a registration form as attached and present this with your entry fee of £10 per person to a volunteer at the start. It will be an amazing evening so be part of it ! We look forward to seeing you on Saturday. Please click here for more information. 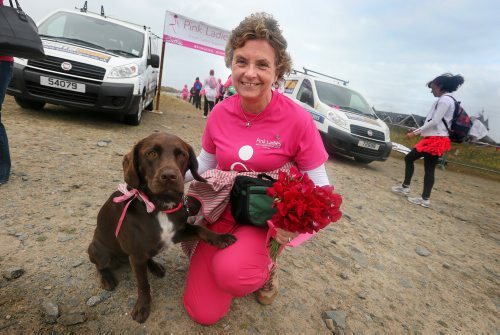 LYNDA WALKER, wife of the Lt-Governor, has announced that she will take part in the Pink Ladies Sunset Coastal Walk on Saturday. Please click here for more information. Did you take any great photos of last night's walks. Please click here for more information. 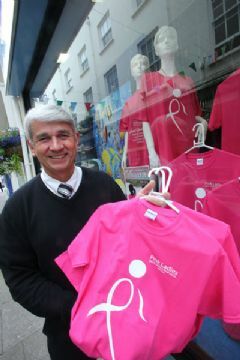 FLETCHER Sports is supporting the Pink Ladies Sunset Walk by selling pink T-shirts. Owner Terry Ferbrache said the shirts, which have been on sale for a couple of days, were going well. The tops are in the Town and Bridge shops and cost £5 each. Hamilton Brooke designed the shirts, which feature a large logo on the front and writing on the back. Please click here for more information. More Sunset Walk pics ! - 01/07/2015 Please click here for more information. I WOULD like to give a big round of a-paws to all readers and their families who are planning to walk around the coast at the weekend and raise money for the Pink Ladies. Please click here for more information. It's not too late to register !! Did you do the walk on 20th June ? If so, you may appear in one of the many photographs taken on the day !! Please click here for more information. STUDENTS from St Andrew’s School will be donning pink clothes and tiaras for this year’s Pink Ladies Sunset Coastal Walk. 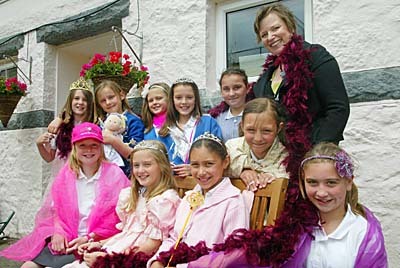 Head teacher Linda Paley had hoped to get 10 students from the school involved – one for each year the Pink Ladies has been going. Instead lots of students have come forward, far exceeding her expectations. Please click here for more information. 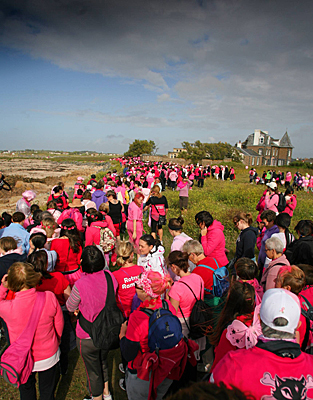 Around 1,500 took part in Saturday's The Pink Ladies Sunset Coastal Walk 2015 for breast cancer awareness.... Please click here for more information. Supporters with special reasons for taking part include: Yvonne Elliott, who had a mastectomy six years ago. She will be selling badges at the walk and wants as many entries as possible. The new unit will make a huge difference to women to have all of the treatment areas and diagnostic equipment in the new block and also to be able to see specialists in the same place. 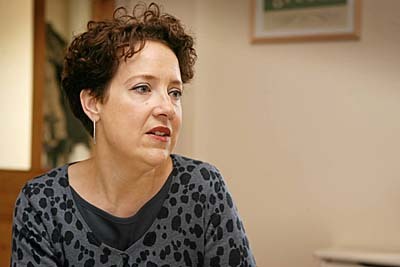 NatWest, which is entering a team, with Maaike Kreckeler and Chrissie Golding, who have both had breast cancer, among its number. The new unit is going to make things so much easier for women going through what we have had. To put all the treatment and diagnosis areas in one spot will really help, said Chrissie. Please click here for more information. THE fifth Pink Ladies’ Sunset Coastal Walk met with a misty start on Saturday but those taking part had a clear vision on why they were doing it. 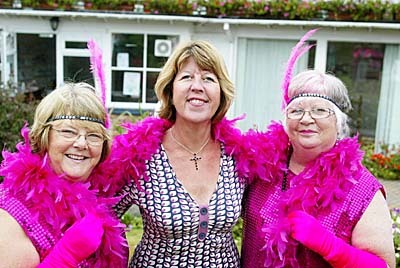 The breast cancer support group’s biennial event raised £92,000 when it was last held in 2013. Please click here for more information. To view and purchase photos from the Guernsey Press ... Please click here for more information. Facts about the 2013 Sunset Walk and how the funds raised will be used....... Please click here for more information. THE staff at Saffery Champness are no strangers to supporting the Pink Ladies. Women from the firm have donned cerise outfits and put their best feet forward on every walk so far. And this year is no exception. Please click here for more information. FLETCHER SPORTS on the Bridge has stepped out in style to urge women to take part in the Pink Ladies Sunset Coastal Walk later this month. 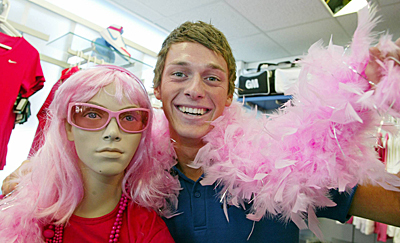 Following its recent move to the corner of South Side and New Road, staff dressed one of its windows with the coastal walk theme using a mannequin decked out in pink sports gear and a feather boa. Please click here for more information. - 22/06/2009 Please click here for more information. The Saffery Champness Sunset Walk team, the Saffery Champs, are: front row, from left, Ghazaleh Maunder, Karen Meagher, Sharon McHenry, Lindsey Dean, Sharon Hickman and back row, from left, Kelly-Anne Lee, Carla Allen, Annie Dodd, Jenny Warry (yellow dress), Maureen Tough, Claire Tersigni (white top), Vanessa Fletcher, Bernie Gilman. 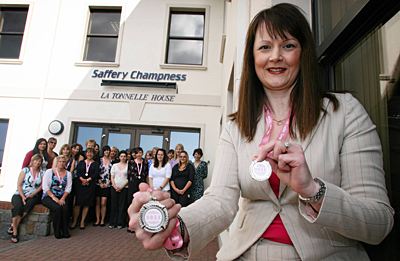 Saffery Champness are also donating the medals for all those who complete the Pink Ladies Sunset Walk. Picture by Tom Tardif Please click here for more information. Before Bulstrode House was refurbished, the Breast Unit was short on space and a grim environment to hear what was often difficult news. But thanks to proceeds from the Pink Ladies’ Sunset Coastal Walk, the state-of-the-art facility is now the envy all UK breast services. As islanders gear up for Saturday’s walk, Jill Chadwick finds out how the girls plan to use the funds raised to help local ladies Please click here for more information. Reeling from the news that her mother had breast cancer and it had spread throughout her body, Ash Spinks said it was beyond doubt the worst moment of our lives. While her Mum, Jo, is now responding well to an alternative treatment, the family is still on tenterhooks but hoping that her energy and quality of life will continue for as long as possible. Please click here for more information. THOSE who complete the Pink Ladies Sunset Coastal Walk will be able to toast their achievement in style. 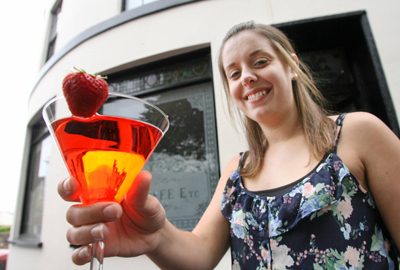 Randalls has teamed up with the Prince of Wales pub to create a special pink cocktail. Please click here for more information. ISLANDERS are being encouraged to back a good cause by buying one of 500 bright pink charity t-shirts in support of the Pink Ladies’ Sunset Coastal Walk. Please click here for more information. There is still time to join this year’s Pink Ladies Sunset Walk on 22 June – and there’s never been a better reason to get your walking shoes on. 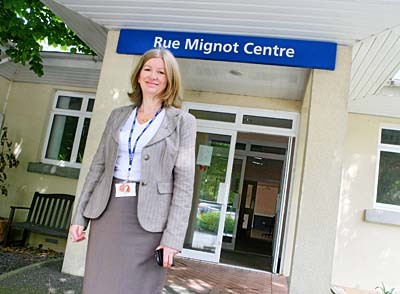 Funds raised will go directly to the island’s new breast unit, which will make a huge difference to thousands of women, as Kay Leslie reports in the Guernsey Press and Star Please click here for more information. 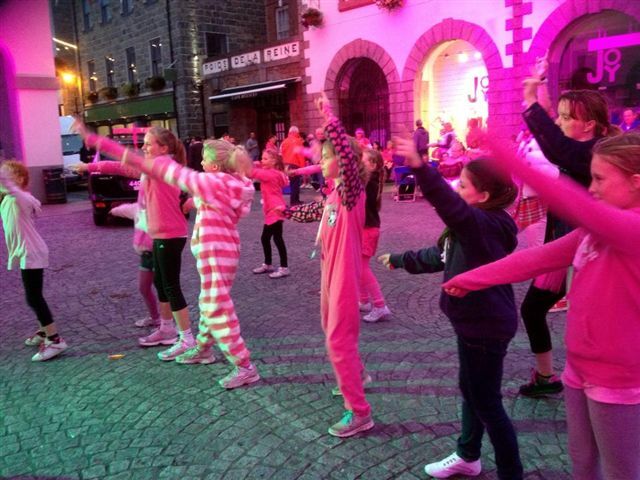 Pink party in the square, Sunset coastal walkers end event with celebration in Town Please click here for more information. 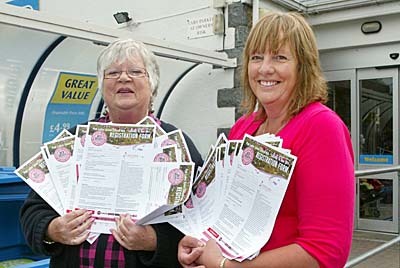 THE Pink Ladies were out and about at the weekend to encourage more women to sign up for the Sunset Coastal Walk. The fund-raising event takes place on 18 June and there is still time to enter because the 31 May deadline has been extended, although organisers would appreciate receiving forms as soon as possible. Please click here for more information. 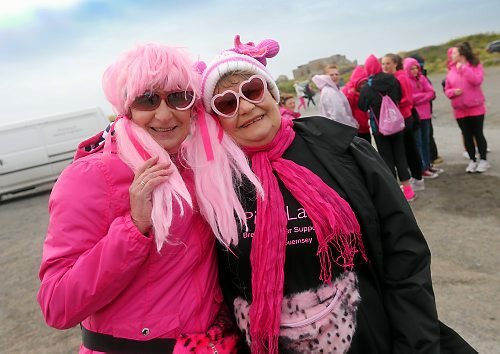 WITH just three weeks to go, many of you will already have your outfit sorted for this year’s Pink Ladies’ Sunset Coastal Walk. And by the looks of it, you’ll be walking in style. Yet again, pink has staged a bit of a come-back on the catwalks. Please click here for more information. The countdown has begun !! Three weeks to go before the 2013 Sunset Walk and registrations are still coming in thick and fast. Please click here for more information. ONE Pink Ladies sunset walker will soon be stepping out in style. Sue Brehaut, 55, an employee at Schroders Private Bank, was the lucky winner of a pair of new trainers from Intersport. Please click here for more information. With three young children and an unquenchable zest for life, Tracey Coleman battled breast cancer for almost a decade. She lost her fight last year but remains an enduring inspiration for her family. In a moving testament to her mother’s courage, Clara Coleman explains why she’ll be taking part in the Pink Ladies Sunset Coastal Walk on 20 June – and why other women should, too... Please click here for more information. 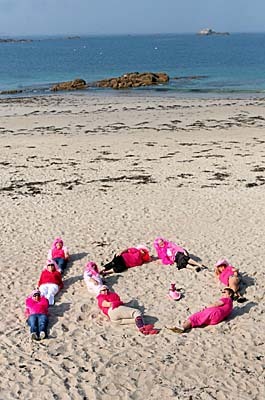 CALLING all ladies who love to wear pink, enjoy a stroll along the coast and want to do their bit for charity. 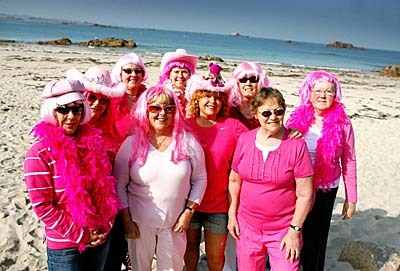 This year’s Pink Ladies’ Sunset Coastal Walk is taking place on Saturday 18 June and the local breast cancer charity group will be at two island locations tomorrow– St Peter’s Food Hall and Friquet Garden Centre between 10am and 4pm – to help people sign up for this popular fund-raising event. Please click here for more information. 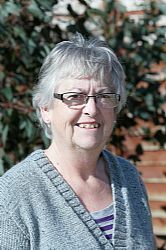 YVONNE ELLIOTT is a lively, active 60-year-old who relishes looking after her young grandsons and spending time with friends and family. Her energy belies the fact that she had a mastectomy six years ago, later deciding to go through the major surgical steps involved in reconstruction. Although she has recently been recovering from an unrelated serious condition, Yvonne remains full of positivity. She will be selling badges during the Pink Ladies Sunset Walk on Saturday 22 June as her way of helping a ‘brilliant’ organisation to raise funds for the brand new breast unit at the PEH. Please click here for more information. With just over a month to go until this year's Sunset Walk, we would like to urge any walkers to get their registration forms in asap so that we get a good idea as to the amount of participants on the day. Your help with this would be very much appreciated and we look forward to seeing you on the 20th June ! Two of the women supporting the Pink Ladies Sunset Walk on 22 June have a particular, and poignant, reason for getting involved and trying to ensure that as much as possible is raised. Maaike Kreckeler and Chrissie Golding talk to Kay Leslie about their experiences... Please click here for more information. 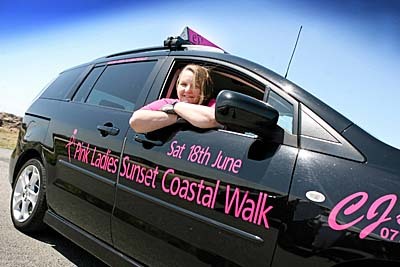 A TAXI driver touched by the Pink Ladies campaign to get people walking to raise money for local breast cancer support has decided to advertise this years Sunset Coastal Walk on her cab. Please click here for more information. 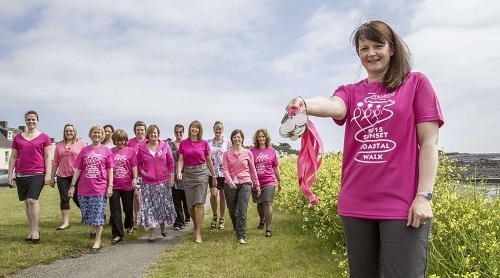 BUSINESSES are being urged to get behind the Pink Ladies’ Sunset Coastal Walk. This year marks the 10th anniversary of the charity, a local support group that offers advice and help with and raises awareness of breast cancer. Please click here for more information. 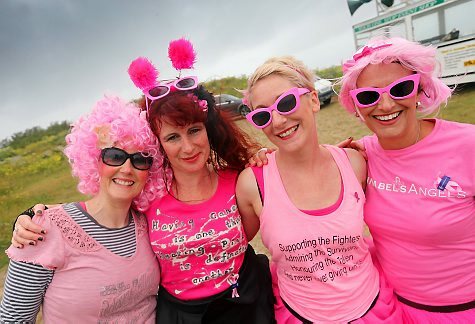 The Pink Ladies hope that 2,000 women will turn up for their Sunset Coastal Walk in June to raise funds and show support for the charity that does so much for women with breast cancer. Jill Chadwick met three women, two of them sisters, who talk about how the group has helped them........ Please click here for more information. Download your Sunset Walk sponsorship form here Please click here for more information. AS THE Pink Ladies celebrate their 10th anniversary, this year’s Sunset Coastal Walk looks set to be bigger and better than ever. On Saturday 18 June, thousands of women are expected to walk the 10.5-mile route for charity. Please click here for more information. Download this year's Sunset Walk sponsorship forms here...... Please click here for more information. Download your registration form for the walk on 22nd June here Please click here for more information. The registration form for this year's Sunset Walk on 20th June is now available to download......... Please click here for more information. 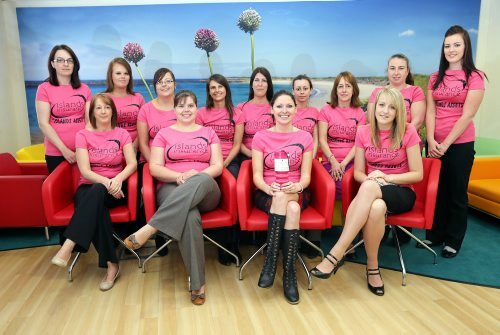 FINANCE workers at Saffery Champness are encouraging women to get involved with this years Pink Ladies Sunset Coastal Walk. The company is sponsoring the medals that will be given to every female who completes the event. Please click here for more information. The island is to have a brand new breast cancer unit bringing diagnostics, consultation and treatment under one roof. Kay Leslie reports on the new facility and how funds raised by this year's Pink Ladies Sunset Walk will help STANDING in the middle of a building site in the hospital grounds, Karen Leach, lead nurse for cancer and palliative care, is smiling broadly. Please click here for more information. Calling all girls: it is time to root out your tutus and trainers... the Pink Ladies Sunset Coastal Walk is back. And with this years charity fund-raiser looking set to be bigger and better than ever, Zoe Ash reveals how it is time to start thinking pink. GUERNSEY women are being asked to walk this way for charity. Please click here for more information. This year's Sunset Walk t-shirts will be available to purchase at Fletcher Sports, hopefully in the next month. Please click here for more information. 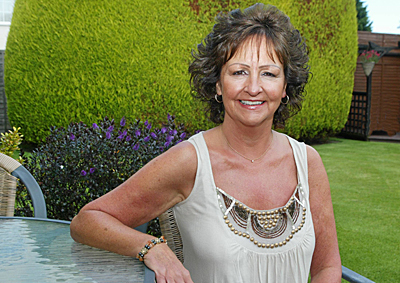 Mary Robertshaw was 36 when she was diagnosed with breast cancer. The Year 6 teacher at Notre Dame Primary School found a lump in her breast at the end of June 2009. Within two weeks of a doctors appointment she had been diagnosed with cancer. Please click here for more information. THE Pink Ladies Sunset Coastal Walk is back this year and will take place on Saturday 22 June. Please click here for more information. The Pink Ladies are delighted to announce that the Sunset Walk 2015 will be held on Saturday 20th June..... Please click here for more information.